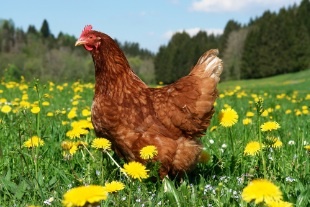 Chicken refers to a type of domestic fowl, which is specially bred for producing eggs and meat for human consumption. Chicken is found throughout the world and its meat is very versatile and one of the most widely consumed meats in the world. Chickens are available in a range of sizes determined by their age. They are usually sold oven ready, meaning they are plucked, drawn and trussed. They are the cheapest of the poultry family to buy, but intensive farming has taken the juicy succulent taste away from some chickens on sale. As with all animals, the tastiest chickens will have been reared in a good environment. The most important thing about chicken is to find a source where the birds have been reared in natural conditions. There has been a great deal of discussion about how best to rear chickens. The demand for this meat has put pressure on farmers to increase their output. But here at Meat No Veg we still believe the life the animal leads is reflected in the taste of the meat and all our chickens have lived a more natural existence than their intensively reared counterparts. Whether you are buying a whole bird or smaller cuts of meat, always buy meat that has a healthy appearance. It should have a high proportion of flesh with a plump but firm breast and pliable feet. There should be no imperfections such as cuts, bruises or broken bones. Visit our 'how to roast a chicken' page to find out more about chicken.